Conservation agencies acquire land through purchases and donations for the purposes of conserving and enhancing natural ecosystems, wildlife and fisheries habitat, and plant or animal species. The Government of Manitoba has signed Memorandums of Agreement (MOAs) with three conservation agencies to include lands they own and manage in the protected areas network. Through the MOAs, Manitoba and partnering conservation agencies take that extra step to ensure that these conservation lands included in the protected areas network meet Manitoba’s standard of protection. Very little Crown land is available for protection in southern Manitoba where little land remains in its natural, pre-settlement state. Protecting private lands gives us a way to build invaluable habitat corridors that help species move safely between the few larger protected areas in this part of the province. 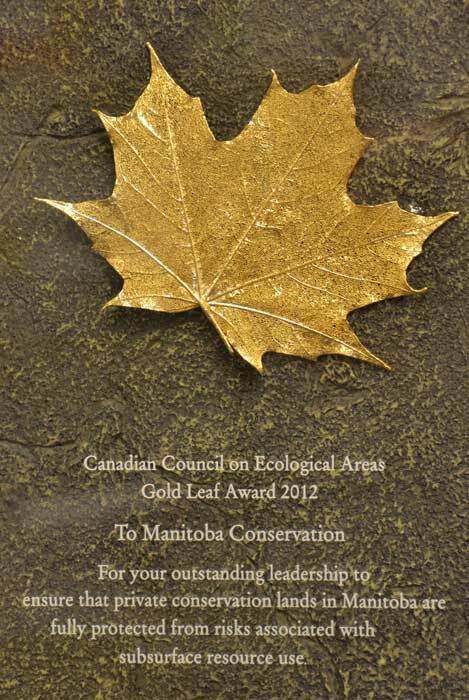 The Canadian Council on Ecological Areas recognized Manitoba Conservation and Water Stewardship and these MOA partners with the 2012 Gold Leaf Award for being the first jurisdiction in Canada to fully protect private conservation lands from risks associated with mining and oil and gas exploration or extraction.